Labor Day march and rally in LA | Fight Back! Los Angeles, CA - Thousands of enthusiastic union members united for a great march and rally in the heart of the historical Wilmington Chicano community, Sept 3. Held near the port of San Pedro, the annual Long Beach/San Pedro labor march and rally was led by the International Longshore and Warehouse Union wearing their “Remember Bloody Thursday” t-shirts. Steelworkers, carpenters, laborers, machinists, ship scalers and many more union contingents with families, youth, and high school bands marched. Also present was a loud contingent from United teachers of LA (UTLA). Public school teachers from the Los Angeles Unified School District carried a banner. They were greeted by the crowd with cheers of support. 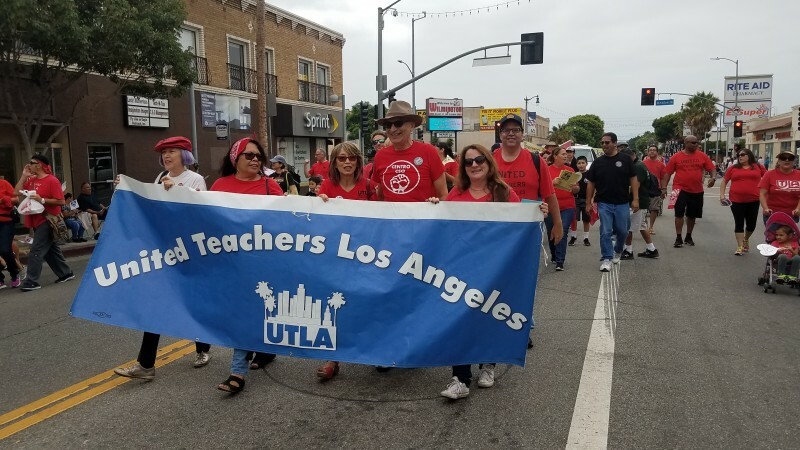 Marching with UTLA was Carlos Montes, an organizer with Centro CSO, calling for solidarity with teachers’ struggle to defend and promote public education. UTLA members recently voted for a strike authorization, with 98% voting yes.